Our in-house laboratories are equipped to provide comprehensive construction materials testing services which meet the appropriate British and European Standards. 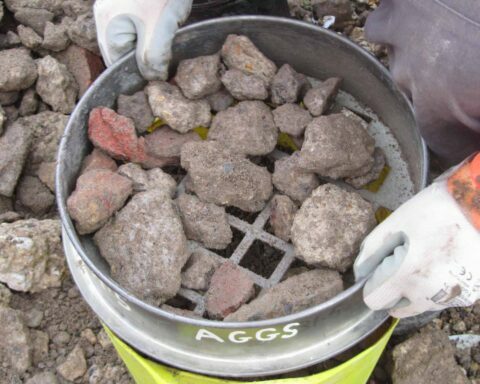 We commonly carry out Concrete Cube and Concrete Core compressive strength testing as well as mechanical, physical and chemical testing of natural and recycled aggregates to ensure they are fit for purpose. A wide range of other construction materials testing is available. Materials testing capabilities offered through external laboratories also include void content of core sample, PRD tests, blacktop analysis, binder recovery, bitumen penetration and bitumen softening point. We also offer a thorough on-site material assessment and sampling service. Concrete Cube Compressive Strength BS EN 12390-3 Determines the strength of hardened 100 – 150mm concrete cubes usually at 7, 14 and 28 days after casting. Used as quality control during construction of concrete structures. Concrete Core Compressive Strength BS EN 12504-1, 12390-3 & 12390-7 Used to assess the strength of concrete in existing structures. Depth of Carbonation (by Phenolpthalein indicator) BS EN 14630 This test is used to establish whether the pH of concrete has reduced. A lower pH can allow corrosion of reinforcement. Sulphate Content BS1881-124 Used to assess whether concrete in a structure is likely to have been attacked by sulphates. Chloride Content BS1881-124 Used to assess whether concrete in a structure is likely to have been attacked by chlorides. Presence & ID of Asbestos HSG 248/RECASB01 Required before carrying out Laboratory Testing on materials derived from demolition waste such as Recycled Aggregates (RA). Grading to ‘Highways’ (MCHW) BS EN 933-2 & BS1377-2 A particle Size Distribution (PSD) test used for grading of aggregates and earthworks materials to determine suitability using Grading Limits and Coefficient of Uniformity. Micro Deval Abrasion BS EN 1091-1 Determines resistance to wear of aggregates. Magnesium Sulphate BS EN 1367-2 Determines resistance of an aggregate to frost and thaw. Frost Heave BS812-124 Determines the amount of movement that may be caused in an aggregate by frost. The above tables do not list all available tests. Please contact our laboratory manager to discuss your site investigation testing requirements.